Penn football has seen great success this season. A big part of their explosive offense is Senior running back Hunter Whitlow. Penn started the season with a 12-7 loss at Valparaiso. Since then, the Kingsmen have won 11 in a row and are averaging 32.8 points a game. Whitlow, who is 5-foot-8 and 175 pounds, punishes opponents for 6.2 yards a carry. He has scored five touchdowns this season. 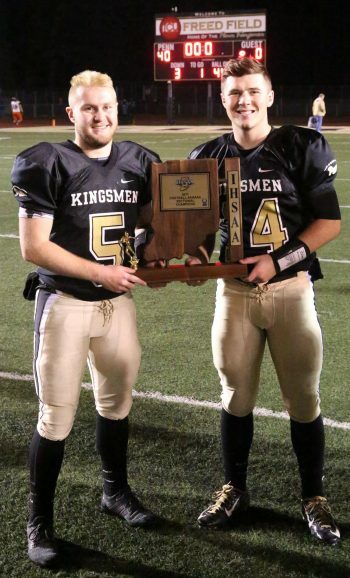 “It’s definitely been a journey from where our offense was at the beginning of the season to where it is now,” said Whitlow as the Kingsmen prepare for the Semi-state. “Things were not how we wanted them and we knew our habits needed to change. The team’s apparent change during the season was highlighted as Penn was able to take down Valpo 13-0 in the playoffs. Whitlow says his favorite part of this season was playing Brother Rice, as he thinks that game was the big turning point of this season. Whitlow has truly enjoyed his experience with Penn football, as he talked about how much he has loved the bond between him and his teammates. They’ve shared many ups and downs and Whitlow claims he wouldn’t want those memories with anyone else. Whitlow has now spent four years under head coach Cory Yeoman, and claims the coaching staff is “by far the best in the country.” He says being part of the football team is about a lot more than playing football. As Whitlow’s time at Penn gets closer to its end, he says he does in fact plan on playing football at the next level. Any team at the next level would count themselves as lucky as the Kingsmen to have a hard working, successful player such as Whitlow on their roster.